Here's some progress on my Pyramid print made over the Thanksgiving long weekend. There are 5 layers of color (the two areas of blue are slightly different and printed separately). If you look at the original pyramid and eye motif on the dollar bill (left), you'll see that I've enlarged the amount of space between the bottom of the pyramid and the "eye of God" that hovers above it. You'll also see that I've given the God's eye some skin tone and iris color. There will be a small human figure standing in that enlarged space, on top of the unfinished pyramid. 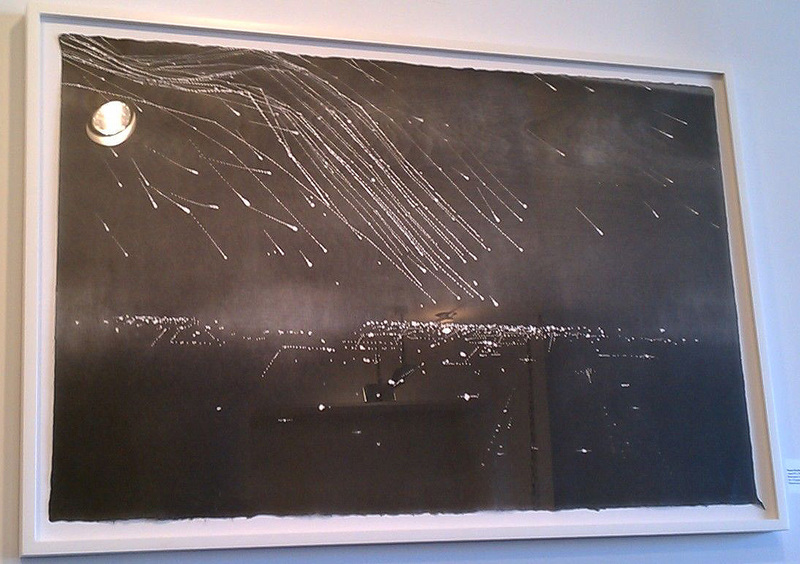 But first, I'll be working with the "sky" and the falling stars. Sometimes it's hard for me to loosen up my drawing hand, so I decided to force myself into looseness by using a power drill to draw on my wood block. Not sure how this will look once it's printed, but I'm hoping it will look like falling stars. I always love going to New York during Print Week, and I was happy to make it again this year. Here is just a taste of what I saw yesterday on my whirlwind tour. Most of the photos I took were of woodblock work, but I also snapped a few shots of other work that I enjoyed. Hope you enjoy it too. My first stop was the Editions and Artists' Book Fair in Chelsea. I neglected to take photos there, but you can see a slideshow in this online article from Art in America to get a flavor of the event. The one shot I did take was the one here, Daniel Heyman's large 65-part etching called When Photographers Are Blinded, Eagles' Wings Are Clipped. I also enjoyed the work at Anchor Graphics. Check out their website to see their impressive roster of artists. My second stop was IPCNY for New Prints 2011/Autumn. Of all the shows I saw, this was my favorite. IPCNY exhibitions always run the full range, from hugely famous artists to emerging artists and covering pretty much all the techniques available to printmakers. 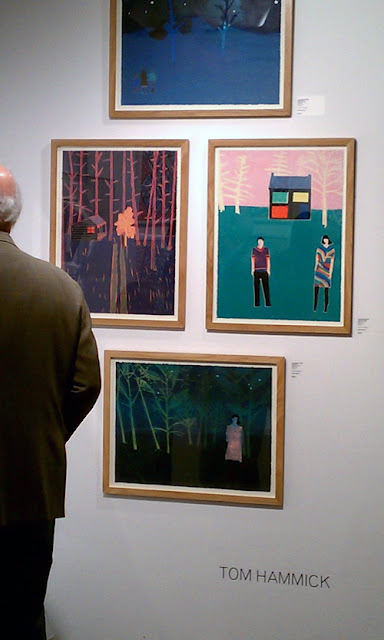 Here are some of the works I saw, focusing on woodcuts. I was also happy to see work by my cyber-friend Rick Finn on the wall at IPCNY. My photo was blurry, but you can see his winning "Buddha (mourning drape)" here. 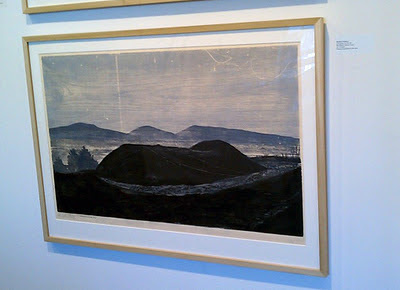 I finished my day at the IFPDA Print Fair at the Armory. 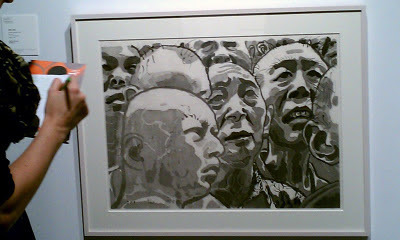 Here are a few photos, again focusing on woodblock prints. 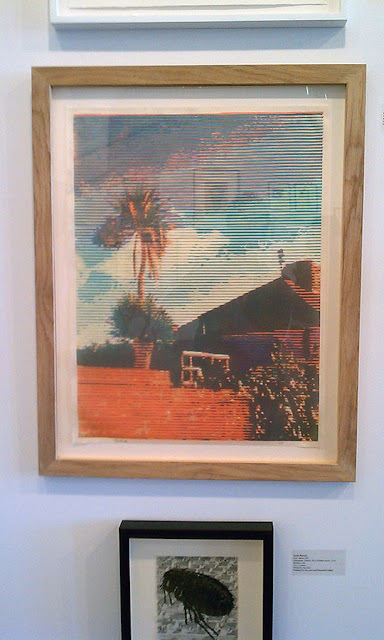 These reduction woodcuts by Tom Hammick were some of my favorites at the fair. They struck me as both light and brooding, both simple and complex. They made me linger even though my eyes were tired, or perhaps because my eyes were tired. 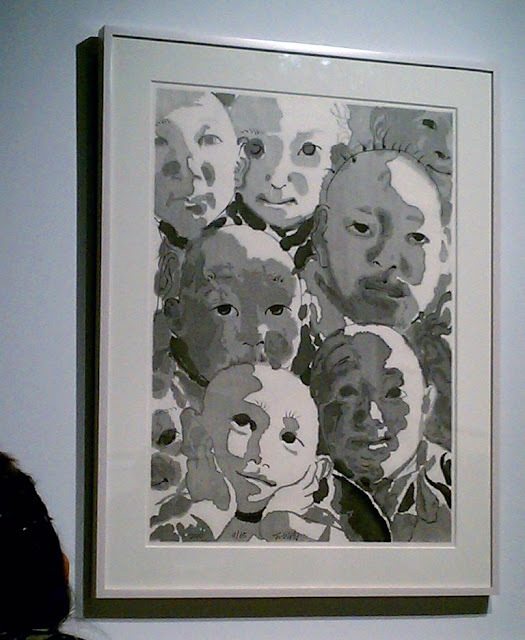 These woodblock prints by Fang Lijun were astounding. They looked so much like ink paintings. Very beautiful and haunting. I've recently gotten acquainted with artist Sarah Brayer, who lives and works in Japan, and I looked for her work at the fair. 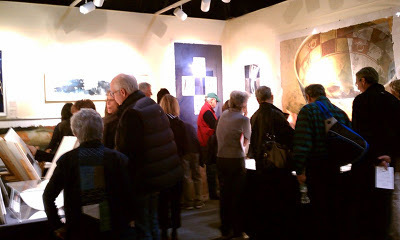 I found it at the always-jam-packed Verne Gallery booth where I was unable to take any good photos, but check out Sarah's web site to see her latest handmade paper works, some of which contain luminous pigments. The series about money that I'm currently working on, Loaded, is based on designs found on the back side of a U.S. one-dollar bill and I think it's safe to say that no examination of the symbols on the bill could ignore the Great Seal. Finalized in 1782, the Great Seal is basically the coat of arms of the United States and has appeared on coins, stamps, uniforms, passports and other government issued items. The "front" of the seal shows an eagle bearing a striped shield with the motto "e pluribus unum (out of many, one). The "back" of the seal, an image of an unfinished pyramid topped by "the Eye of Providence," is the image that I'll be working with for this next print. On this pyramid side of the seal there appear two sets of Latin words. 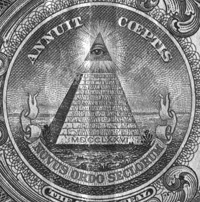 Above the Eye is written Annuit Cœptis, meaning "He approves (or has approved) [our] undertakings", and below the pyramid it says Novus Ordo Seclorum, which means "New Order of the Ages." The pyramid, which appears to be unfinished, has thirteen steps, representing the original thirteen states and the future growth of the country. The lowest level of the pyramid shows the year 1776 in Roman numerals. The Eye of Providence, like the pyramid, can be traced back to Egyptian mythology and the Eye of Horus, as well as Hindu and Buddhist iconography. In Christianity the Eye is usually surrounded by a triangle and is said to invoke the Trinity (Father, Son and Holy Spirit). The implication of the combined images is that Providence, or God, favors the establishment of the United States and will watch over its development. One of the designers of the seal, Charles Thomson, said this about the pyramid. The pyramid signifies Strength and Duration: the Eye over it and the Motto allude to the many signal interpositions of providence in favour of the American cause. The date underneath is that of the Declaration of Independence and the words under it signify the beginning of the New American Era, which commences from that date. The Eye of Providence is a symbol that became associated with Freemasonry in the late 18th century, and conspiracy theorists make the claim that the Eye in the national seal indicates the influence of Freemasonry in the founding of the United States. I did a little research on the Freemasons and as far as I can see the worst fault of the Freemasons is that they don't allow women into the lodges. I'm not sure why conspiracy theorists would dwell on the pyramid and eye, but maybe I'm missing something. If anyone knows more, feel free to enlighten us in the comments section. I'm now in the carving stage, which will take a few days. 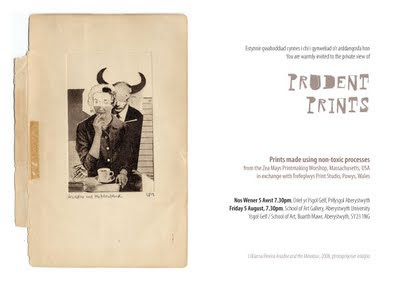 Every year, in conjunction with "Print Fair North" open studios, Zea Mays Printmaking in Florence, MA, holds a print raffle to benefit the Ruth Chalfin Memorial Scholarship Fund. 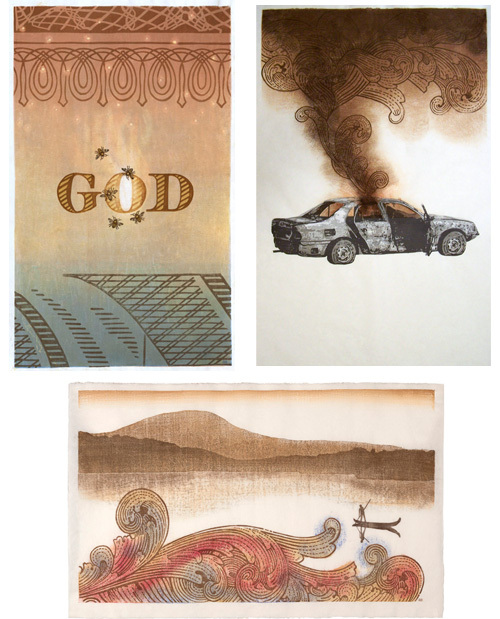 The fund allows individuals who have financial constraints to take printmaking classes. There are some great prints this year, including two works by Barry Moser, an internationally recognized illustrator and master wood engraver. Also included is my Blessings Kite print (seen at left) and works by studio member artists Anne Beresford, Liz Chalfin, Scott McDaniel, Pam Crawford, Meredith Broberg, Lyell Castonguay, Maya Malachowski Bajak, Lilly Periera, Claudia Sperry, and Joyce Silverstone. The raffle prints can all be seen at this link. Tickets cost $10 each or 3 for $25. You can buy as many tickets as you want, and can direct them all towards one print, or spread them out over several. Tickets can be purchased in person during studio hours or, if you're from out of town, by phone. The drawing will be November 13, 2011. Car image is from a news photo of a burned-out automobile in Iraq. I meant to invoke all the money that the United States has wasted on war for the past 10 years, but as I worked with the image I began to see other meanings as well -- the money we spend to maintain our petroleum culture, the collapse of the auto industry, the costs of both war and oil relative to our environment. Maybe there's more. I'm trying not to over-think this series, trying to follow my initial self-assignment of using a dollar bill as my starting point and allow images that appeal to me to be just that -- images that appeal to me. This one felt right. 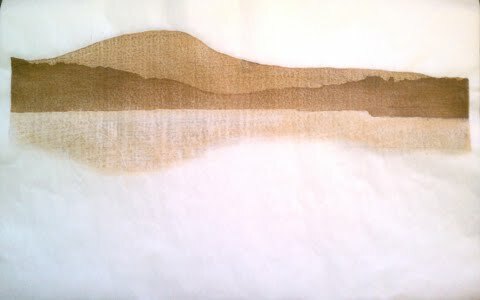 On a technical note, and this is one of the big drawbacks of publicly blogging my process, many of my fellow printmakers commented on the beautiful wood grain that appeared in the smoke after four layers of brown. I hadn't expected that, but I liked it and I was upset and conflicted when it disappeared upon adding the carved dollar design. It was a really hard decision for me to go ahead with the carved design, but I felt that without it the piece didn't say what I wanted it to say. I wanted to talk about money, not wood grain and not woodblock printing. So the wood grain is gone. And if I hadn't blogged it, you would never have known it was there… At least now I know how to control -- and not control -- wood grain. Always learning. The other thing I'm grappling with is that I started Loaded, this series about money, on July 7 and on September 17 Occupy Wall Street began. I like to tackle topics that are timely, but this is maybe a little too timely. I feel a lot of pressure now. Yet here I am. Last week I added four layers of brown to my "Smoke" print. One more layer to go and the print will be finished. I think. Two of my prints, Borders #1: U.S./Mexico (left) and Borders #2: Great Wall (right), have been accepted into a show at Worcester State University called The Global Perspective. 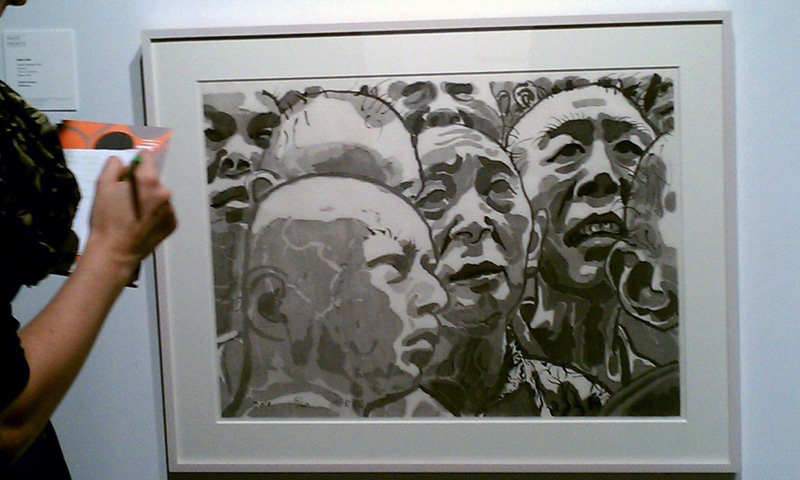 I'm also happy to announce that Great Wall has received an Honorable Mention from the judges. The recently remodeled Worcester State Gallery features 2500 square feet of exhibit space and is building a reputation as a primary gallery for arts in central Massachusetts. 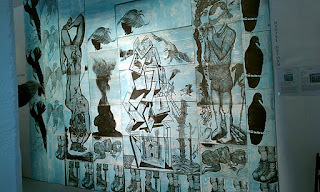 I'll be attending the opening on Thursday, October 20, 2011 from 6:00 to 8:00 p.m. and I hope if you live in the area you'll join me! I have some carving to do before I print again. Third layer of color applied. This image is based on a news photo of a burned-out car in Iraq. The car is complete, but the full image is not finished yet. Next I'll be using a new piece of wood to create some smoke and fire. The traditional Japanese method of woodblock printing calls for carving one block for each color, although in practice a printer will often designate areas for more than one color on a block if the areas are far enough apart to be inked accurately. But for the most part, it's one color per block. As I've begun to work with very large prints and blocks of wood, more and more often I've found myself seeking ways to save money and time by consolidating my materials, and one way I've found to save on wood is to use the reduction method whenever possible. 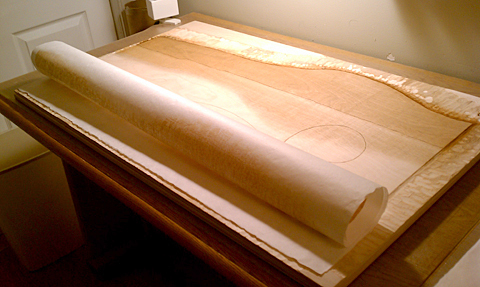 The reduction method involves carving a block, printing that block on all the sheets of paper in the planned edition, then carving ("reducing") the block more, printing again, carving again, and so on until the image is completed. Last week I started a new print in my "Loaded" series of prints about money, and I'm using the reduction method to create an image of a car that will be central to the print. Below are photos of the first two printed colors from the initial reductions, plus a photo of the block carved for a third time and ready to print. There will be one more reduction after this one. First, a pale blue impression of the whole shape of the car. Then I went back and carved again. Next I printed a gray layer. Today I finished the third "reduction" and tomorrow (hopefully) I'll print it using another tone of gray. 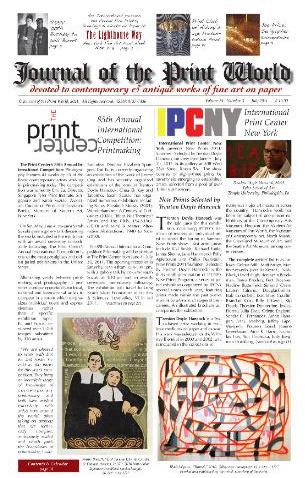 Several friends have told me that my portrait of John Alexander and Thomas Roberts, the gay Pilgrims from Plymouth Colony, was on the cover of Journal of the Print World but I was unable to find a copy. 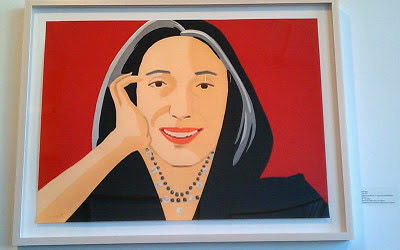 Today my printmaker friend Melody Knight Leary sent me a link to an image of the cover online, so I've finally seen it. Thanks, Melody. And thanks, Journal of the Print World! The last couple of prints I've made are too big for my flat files, so I've been at a loss for how to store them. Right after the Great Wave prints were completed I rolled them and put them in a tube, but I was concerned that the curl would be hard to get rid of so I started thinking of other options. I was considering setting up something in our basement, but we took in a couple of inches of water during Hurricane Irene so I'm very leery of using the basement now. Buying larger flat files is the obvious solution, but my spare-bedroom studio in our not-very-big ranch house is already feeling cramped with the flat files I have, so I'll need to figure out where I can put more. In the meantime I put out the question to the Baren Forum listserv to see if anyone had any ideas and I got some great responses. 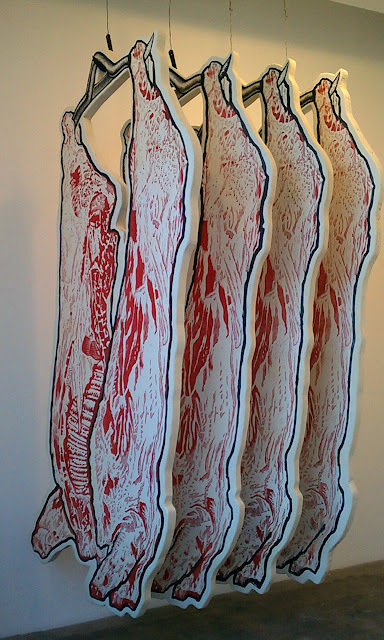 For now, until I figure out something better, I'm hanging the prints on the back of my studio door simply using skirt hangers and some strips of foam core (photo) as suggested to me by printmaker Barbara Mason. You can see that there's still some curl at the bottom of the prints from being in the tube for a few weeks. There's also not much room on my over-the-door hook, so I'll need to upgrade that as I make more prints. Woodcut artist Maria Arango pointed out that there are products made for hanging architectural drawings, so I'm looking into that option. I'd like to find a wall-hanging unit of that type, since I'm lacking in floor space. Some folks seemed to think that rolling the prints isn't really a bad option. That would make it very simple if it were true, so I may try keeping a set of prints rolled and see how it works over time. My favorite response came from Mexican artist Guadalupe Victorica who has a friend who stores large prints between 2 plywood boards under the mattress. Now that's a good use of space! Under the bed is possible too, although my dog likes to sleep there. Of course, I could just sell all the prints! That would completely solve the storage problem. Based on a much enlarged section of the back of a one dollar bill. Honey bees have fascinated human beings for millenia. The honeybee, honey and hives are emblems of sweetness, wealth, and industry. Like us, bees have elaborate societies, they work hard, and like us they are suffering from strange maladies in this century. These creatures, who sting and yet are able to transform beauty into sweetness using their own bodies, have been cited in religious texts for thousands of years. Here's a small sampling of the ways that bees and honey have been linked to God in various traditions. Interestingly, John Eliot, who translated the Bible into a Native American language in the 1660s, noted that there was no Native American word for wax or honey. Eliot claimed that the Indians used the term ‘White Man’s fly’ to describe bees. It seems that the native Americans were more in tune with the sting of the bee than the honey, as bees were interpreted by tribes farther west as a dark omen and harbinger of the white man's arrival. I guess this links bees with the expansion of capitalism in America. 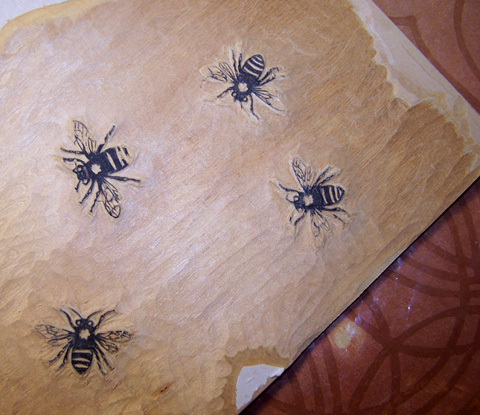 This morning I'm thinking of this little edition of 10 prints as a handful of flowers humming with bees.